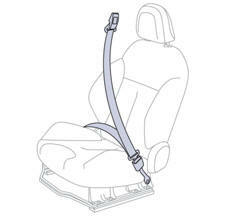 The front seat belts are fitted with a pretensioning and force limiting system. 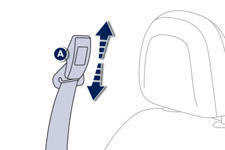 This system improves safety in the front seats in the event of a front or side impact. Depending on the severity of the impact, the pretensioning system instantly tightens the seat belts against the body of the occupants. 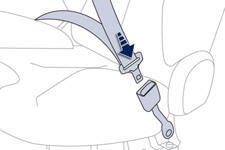 The pretensioning seat belts are active when the ignition is on. switched on, this warning lamp comes on in the instrument panel if the driver and/or the front passenger has not fastened their seat belt. From approximately 12 mph (20 km/h) this warning lamp flashes for two minutes accompanied by an audible signal of increasing volume. Once these two minutes have elapsed, this warning lamp remains on until the driver and/or the front passenger fastens their seat belt.